A trip to the Australasian Quilt Convention packed with 95 stall holders under the one roof obviously means some fabric purchases. How can it not? No surprises here ~ dots! These dot prints are Japanese fabrics. The white dots on both blue and green backgrounds (randomly featuring the word love) have Olympus and Made in Japan on the selvage and are 100 % cotton fabrics. The multicolor dots are printed on a natural cotton/linen blend base and are by Japanese company Sevenberry. Available from Ballarat Patchwork. Black and White Stripe and broad Red and White Stripe ~ no selvage means no details, but both are 100% cotton fabrics. And finally more Japanese fabric 30cm pre-cuts by Yuwa Fabrics and/or Cosmo Textiles with a focus on florals (again no selvage - feel free to leave info in comment section if you have specific details for these fabrics). 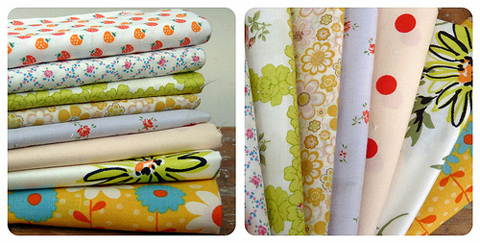 A few of the floral prints are re-stocks of long time favorite prints. Love these! Really unique and so fun! I love polka dots, too! Love the purchases. Is that cotton/linen blend rough? It almost looks like burlap, but I'm sure it doesn't feel like that at all. Oooooo... very nice... love the dotty fabrics especially! Fabulous choices. I can't wait to see what you make with them. 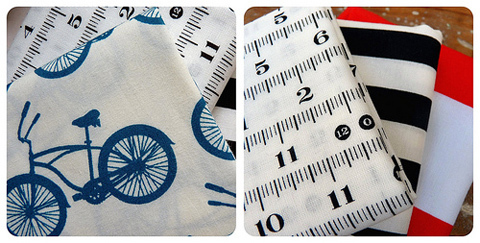 I love the dots on the cotton linen blend! So cute! I haven't seen any like that before and I love it! Since I had my second child last year, and since my husband is often in class and therefore I have less time to pawn the kids off on him and I have less extra cash to throw around, I don't get a chance to browse fabric stores any more. I must say, I always look forward to seeing the Sunday Stash. Forget smell-a-vision... I want touch-a-vision. Or, as I like to call it: TV. I'd love to just get my hands on those textiles!! Especially the lovely vintage florals. Thanks for sharing (always). Patchwork House had "His Cruiser" a few weeks ago...was tempted but the price was out of my range! Love the dots! What a yummy selection Rita! I love the dots on the natural linen. Please don't post your fabric stashes any more. They only make me envious ;-))) LOVE the Polka dots with Love in them! Nice finds Rita. I go one quilt show a year (June in Sydney)and simply adore wandering around the stalls. I have learnt my lesson and go by myself. One year me 'friend' kept saying "havn't you bought enough". Geez. Lesson learnt. Go by yourself and buy what YOU want. I want that multi coloured dot fabric. I really do, I'm already imagining what I can do with it. Ohh, I'm off to see Emma this week then to get some of the blue and green circles with love in them. Perfect. I especially like the dots. Can't wait to see what you do with them. Love the dots especially too. I recently discovered the other day the disadvantage to buying fat quarters... you may not get the selvedge and know what fabric it is. Some of them I've been able to locate online from the shop I bought them at, but sadly not all. Oh, and I love those japanese florals. I wish my budget at the AQC had stretched to allow me to buy some 'just because' things. 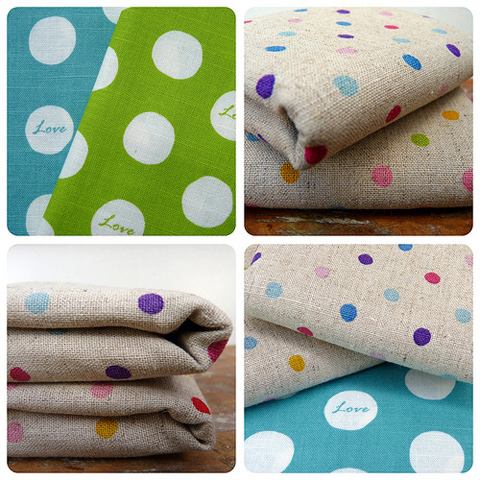 LOVE the multi-colored dots on the natural linen—thansk for sharing!